“On the advice of my counsel, I refuse to answer that question in…in that the answer might serve to incriminate me." This is a quiet episode with no action sequences and without a strange planet to visit, but it does feature some great performances. This isn’t my idea of a great Trek episode, but I can see how it might be interesting to others. Patrick Stewart is great, as always, as Captain Picard and he gets to show us once again why he is the perfect person to be in charge of the Enterprise. During a plot that consists mostly of characters talking to each other, or making speeches, Picard is the ultimate voice of reason. While others around him are seeing Romulan conspiracies everywhere, he remains calm and pragmatic. I can’t even imagine the pressure of his duties: he has to keep his crew and ship safe, he has to follow the Prime Directive, he has to be accountable for his every action with his superiors, and he also has to make many decisions that can change the lives of the inhabitants of whole planets. When he is insulted by being accused of still being influenced by his time of Borg-ness, instead of lashing out, he quietly rubs his forehead for a moment while he comes up with a calm and measured response. Retired Admiral Norah Satie, on the other hand, is anything but calm. She is sweet as can be — that is, until her authority or point of view is questioned. The Admiral is on board because she has made it her life’s work to ferret out threats to her beloved Federation of Planets. It doesn’t seem to matter to her that no conspiracy seems to exist; she is determined to find one, anyway. It was interesting that she always insisted on an audience. I’m sure that since she always thinks that she is right, she wants as many people as possible to see just how right she is. Satie tells Picard how her father used to make her and her brothers debate a topic at the dinner table; no one could leave until every small detail was thoroughly examined and a triumph was to be had. Sounds awful to me, but she seemed quite proud of that particular part of her childhood. Worf is also helping with the investigation and since he doesn’t have any love for Romulan spies, he is happy to help the Admiral. Poor Worf always has to put up with someone bringing up his father’s shame. Worf handles himself pretty well, and even though he wants to believe that the Admiral is right, he is smart enough to follow Picard’s lead and find out the truth for himself. There is a sad medical tech named Simon who only wants to travel the stars and help people. He didn’t go the officer training route because he didn’t want to sit in a classroom for four extra years; he just wanted to join Starfleet and make his mom proud. Unfortunately, the Betazoid aide of Admiral Satie knew that he was hiding a deep dark secret. I liked Simon and felt bad for his obvious inner turmoil. He wasn’t evil; he just lied on his application and changed his grandfather’s identity from Romulan to Vulcan. Now that he has been caught in that lie, he is going home to his mother in disgrace. Admiral Satie is so obviously proud of her career and is equally blind that her actions are out of control. 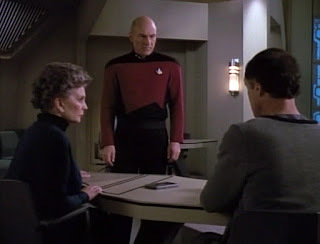 When she is challenged in her beliefs by Picard and also by Worf during her tribunal, she loses her composure and unleashes a tirade that even her superior can see is unbalanced. The lady has to stand there while her superior walks out of the room and it is obvious to everyone that she is going to be relieved of any further duties and retired for good. The real traitor was caught easily and that Klingon fellow wasn’t really the focus of this story. I believe the main point they were trying to make was that it is easy to find evil if you look hard enough, but then you also risk seeing things that aren’t really there, or things that shouldn’t have been found in the first place. Captain Picard is such a balanced and thoughtful fellow. Once again it is proven that very little escapes his gaze. Jean Simmons plays the part of Admiral Satie and she was very good as the icy but impassioned Admiral. A drumhead was a battle-field court-martial that wasn’t concerned with justice, just punishment. Picard also compares Satie’s investigation to a witch-hunt. Simon the medical tech was played by Spencer Garrett. He looked very familiar, so I looked up his bio. He’s a character actor who has been on many shows, but I remember him mostly from Supernatural: "A Very Supernatural Christmas." He played a pagan god who ripped out Sam’s fingernail with pliers. Who can forget that? The guy who composed the music for this series was fired after this episode and replaced with someone with a less dramatic style. I don’t like it when the music is so obvious that it intrudes into the scene, so I’ll have to notice if it gets better. I don’t really feel qualified to rate this episode; it was interesting, but not that exciting and there were no jokes, purple aliens, or spatial distortions which are really more my thing. I’ll leave the rating up to the more cerebral viewers. Mallena loves her DVR, her Pug, anything in the sci-fi, fantasy, and supernatural genres, and her family. Well, not in that exact order. This episode was better than I remembered. It was a quiet-ish episode, you're right, Mallena, but it certainly made a good point. And I always liked any episode that featured a strong performance by Patrick Stewart. Jean Simmons was pretty good, too. I always felt that this episode was one of the best. I feel that the review skates around its real strength... that evil takes a friendly and "reasonable" face. That at a time when there is fear of the "other", evil cloaks itself in a guise of protection. As a society, we must always remain vigilant. Sound familiar in 2016? I agree with Heather. If this episode was shown today people would say it was too transparent and heavy-handed. There would be no doubt about what the issue was that was being portrayed.